I don't think there's any such thing as an unpredictable action. 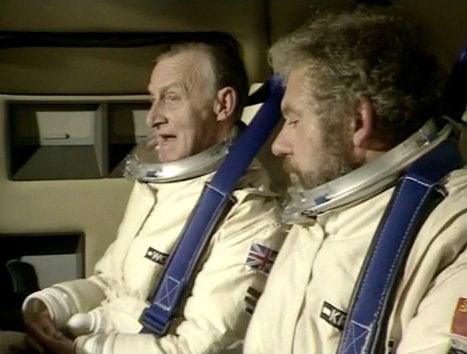 The Star Cops“comedy” episode, although you’d think that being the case they’d have bothered to give Catweazle (Geoffrey Bayldon) an amusing role. I spent the first 20 minutes expecting the worst, with its broad (annoying) shrink out to piss everyone off and some atrocious comedy music from Justin Hayward and Tony Visconti, but it did grow on me, mainly because its custom-fitted to the portly Devis and he’s used rather well. Mind you, this is the one where he suggests playing “a game of hide the sausage” to Anna, which, even for a show playing up the coarse language, felt a little too uncouth. The writer is John Collee again, and the director the on-the-pedestrian side Christopher Baker. 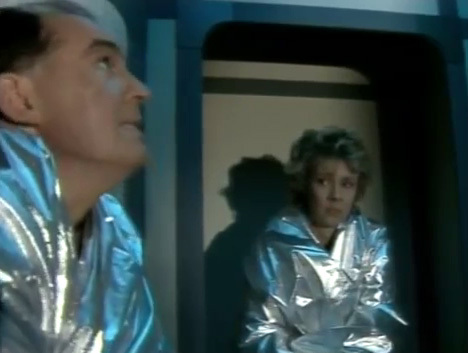 So Moonbase, and its ventilation ducts (not a Vervoid in sight) are never more than obvious sets. 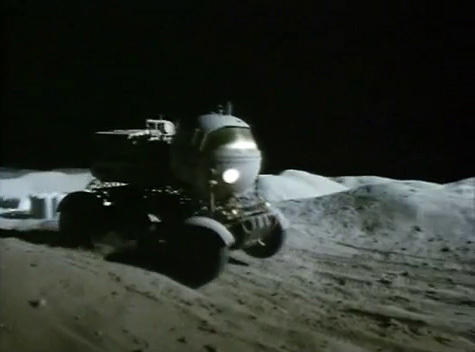 That said, the sequences depicting the depressurisation of the base are fairly decent. The take on psychology and related hang-ups really ensure this one shows its age, even more than casual racial stereotyping in other episodes, though. Dr Angela Parr (Maggie Ollerenshaw) arrives on the Moonbase to psych examine personnel, and Nathan agrees to set an example by volunteering the Star Cops. Inevitably, they’re nonplussed, Kenzy in particular. 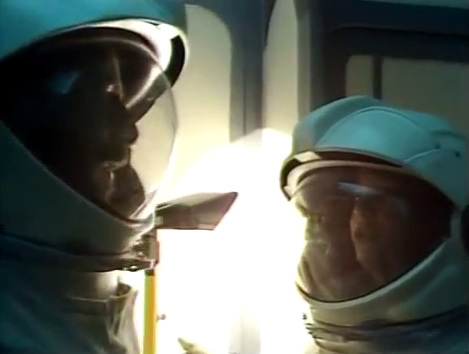 Parr is conducting a project in Space Psychology, no doubt endorsed by the Terry Nation College of Space Studies, and proceeds to behave more like a nightmare shrink from sitcoms of the period than an example of “realistic” futurism. Devis: You, er, spotted any loonies yet? Parr is given to pronouncements such as “I’ll get your people straightened out for you” but, in the rudimentary comedic fashion of undermining the shrink’s penetrating insights, she has an Achilles Heel that is her ex-husband Devis. 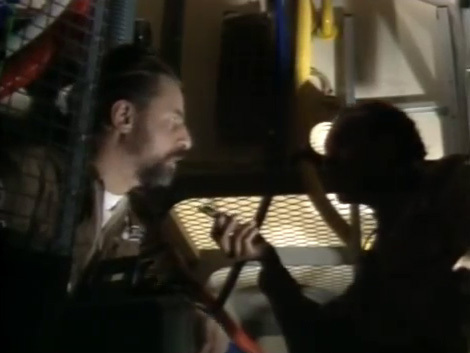 Despite it being very obvious, Trevor Cooper keeps things amusing, and he and Ollwerenshaw have good easy chemistry; “Ever since I’ve been out here, I’ve been really randy” he confesses to his former wife/brain care specialist. 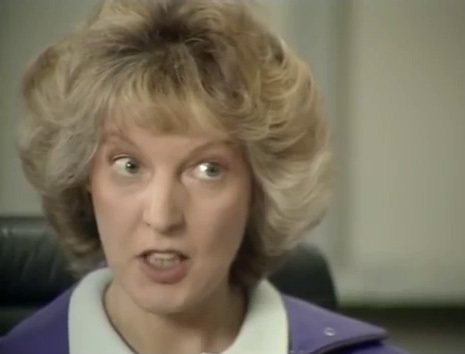 To which she responds, “You were pretty rampant on Earth too, I recall”. 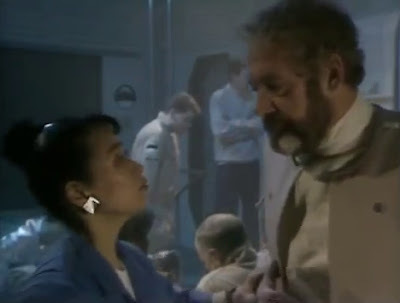 Inevitably, they’re trapped in a room together and her defences come down (“I’m not thatscared” she replies, when Colin asks if she wants a cuddle), and they interrupted by David en flagrante as the station returns to normal. The regular cast are all given their moments, this being a character comedy piece. So Nathan and Pal also get shut in together, with the first clear indications that they may have feelings for each other beneath overt mutual disapproval. She is defensive of shrinks “Because they never know when to stop” and Spring offers up some backstory regarding his father, a computer salesman for Recondite whom he put away when he was a fresh detective on the job. Calder may be the glue holding Star Cops together, but Linda Newton is more than up to matching him in these confessional scenes. Elsewhere Sayo Inaba continues to be furnished with better lines than she’s able to pull off. The thunderingly ignorant shrink witters on about the Japanese sense of duty, only to be disarmed when Anna mentions Devis’ presence. Collecting herself, she asks Anna where they were; “The disorientating effects of a sudden emotional shock”. With this as the predominant plotline, the mystery is very much bringing up the rear, and its pretty minor league. It turns out that Ernest Wolfhartt (Bayldon) has been sabotaging systems on the base, a pensionable thrill jockey (“I liked the feeling of things getting out of control”) It’s weak stuff, and he’s shown sympathy by Krivenko, an increasingly irritating presence who I presume we’re supposed to like but continually undermines Nathan at every turn; it doesn’t really make a whole lot of sense that Spring indulges him so much. The best guest performance here comes from Barry Rutter as Hooper, a temperamental engineer who comes under suspicion (particularly from David, assigned to work with him) but is instrumental in saving the day. 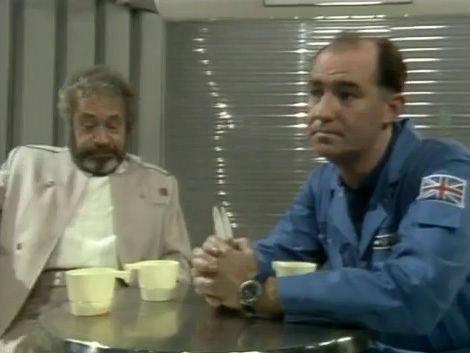 A series as reined in by budget constraints as Star Copsreally benefits from the kind of naturalism Rutter brings (he was one of the regular cast in The Goodies’ short-lived Astronauts TV series). This is one that, on balance, probably had the right director. I’m not sure Harper would have been much cop at the comedy/character moments, although you do miss him when the more dramatic scenes arrive. One thing I’ll grudgingly give the incidental music; while mostly it’s just plain poor or glaringly out of place, I rather like the ambient accompaniment to model sequences; for example. the extended shots of the buggy crossing the lunar surface. While Other People’s Secrets is very much on the lower end of the Star Cops ladder, it’s not unengaging. But it feels like it’s too much too soon to go for a comedy piece, and it’s frivolity is surely antithetical to the serious intent Boucher had for the project. Mr Wooster is an eccentric. Me any my brother, we’re gonna rule London. I love London. It's so wonderfully dirty. How high can you squirt? Is your phone an Android? These are the guys that have been killing you. You don't have to be alone forever. There’s still one man out here some place. How was I supposed to know that you'd become you? You must stop the Mafia from poisoning space. W.A.R.A. Now, what the hell is that? I enjoy various physical pursuits. Are you a good poker player, Commander?